spoiltpig and Holiday Cottages are offering £50 off your first booking. There’s also the chance for a lucky person to win a wonderful weekend break in one of Holiday Cottages’ Dorset properties. All you need to do is purchase one of spoiltpig’s promotional packs, retrieve the promotional code – on the reverse of the sticker – and complete the form below. Simple. Promoter: spoiltpig, Denhay Farms Ltd., Devonshire Road, Heathpark, Honiton, Devon EX14 1SD. 1. This promotion is only open to residents of the United Kingdom (England, Wales, Scotland and Northern Ireland), aged over 18, excluding employees of spoiltpig, Denhay Farms Ltd (the “Promoter”), holidaycottages.co.uk, and all those professionally associated with this promotion. 3. The promotion will run from 00:01 on the Monday 7th November 2016 until 23.59 on Saturday 31st December 2016. 4. Go to spoiltpig.co.uk/competitions/holidaycottages. 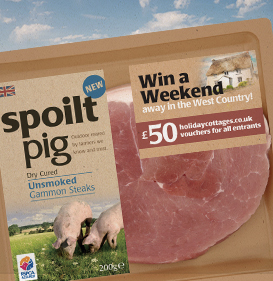 Enter your email address and postcode as well as the promotional code on your pack of spoiltpig bacon and press ‘Submit’ to be entered into the draw. 7. 1 x £500 holidaycottages.co.uk voucher. The voucher must be used in full towards the balance of the winner’s holiday cottage booking. The voucher must be redeemed within 12 months of the competition closing date but the holiday may be taken after this time. Voucher can only be used for one booking. It is not possible to transfer any of the voucher value to a secondary booking. The prize is a £500 holidaycottages.co.uk voucher only, transport and other extras are not included as part of the prize. Voucher cannot be exchanged for cash. 8. All those entering the prize draw will be sent 1 x £50 holidaycottages.co.uk voucher. Voucher is only applicable to new customers on first bookings with holidaycottages.co.uk within one month of receiving the prize. Voucher cannot be exchanged for cash. 10. The winner will be notified within 7 working days of the draw by email and will be required to respond confirming their address within 28 days of initial notification. Failure to do so will result in an alternative winner being selected at random from all valid entries. All valid entrants will receive 1 x £50 holidaycottages.co.uk voucher directly from holidaycottages.co.uk within 28 days of the promotional close date. 14. The name of the winner may be used for promotional purposes by the Promoter, unless the winner otherwise notify the Promoter at the time of accepting their prize. 15. The winner’s full name and county will be available by emailing [email protected] or via post to spoiltpig, Denhay Farms Ltd., Devonshire Road, Heathpark, Honiton, Devon EX14 1SD for a period of one month following the closing date. 16. 16. This promotion is in no way sponsored, endorsed or administered by, or associated with Facebook, Instagram, Twitter or Pinterest. You understand that you are providing information to the Promoter and not to Facebook, Instagram, Twitter or Pinterest. The information you provide will only be used for fulfillment of this promotion unless you have agreed to its use for any other purpose. By entering the promotion all participants agree to a complete liability release for Facebook, Instagram, Twitter and Pinterest. 19. The Promoter cannot accept any responsibility for any damage, loss, injury suffered by an entrant entering the promotion or as a result of accepting or participating in any prize. Nothing shall exclude the Promoter’s liability for death or personal injury as a result of its negligence. 20. If for any reason the promotion is not capable of running as planned for reasons (including but not limited to tampering, unauthorized intervention, fraud, technical failures or any other causes beyond the control of the Promoter which corrupt or affect the administration, security, fairness, integrity or proper conduct of this promotion), the Promoter reserves the right (subject to any written directions given under applicable law) to disqualify any individual who tampers with the entry process and to cancel, terminate, modify or suspend the promotion. 23. This promotion is governed by English Law and participants submit to the exclusive jurisdiction of the English Courts.